Tax reform bills have just passed by both houses of Congress. * The bills are quite different and legislators have much to do in reconciling the bills before any laws are changed. However, we wanted to provide some insight on the current status of the situation. 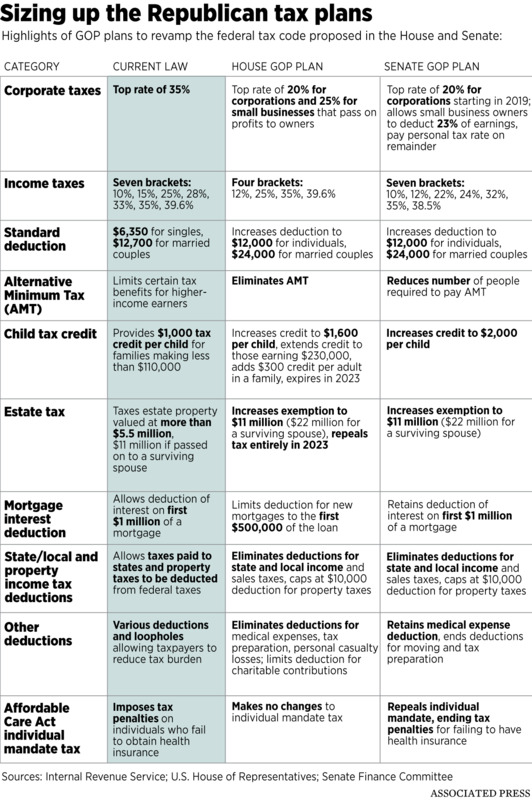 This Associated Press chart (pictured below), based on information from the Internal Revenue Service, the U.S. House of Representatives and the Senate Finance Committee, shows direct comparisons of the possible legislation. Price CPAs will keep you informed as more details become available. And, we look forward to working with you on planning for the future, once there is clarity on any possible new tax laws. *NOTE: Any changes in the tax code would be for the future. The new legislation will have no impact on current year taxes.